To cap off Hispanic Heritage Month, grassroots organizer, independent journalist, and hip-hop activist Rosa Clemente visited Juilliard on October 13 to speak about racism, identity, and politics. The event, “Modern Day Discrimination in the Age of Obama,” was hosted by the Office of Residence Life as part of its Horizons series, and it attracted nearly three dozen dance, drama, and music students to the 11th-floor lounge of the Meredith Willson Residence Hall. 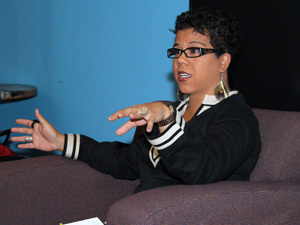 Hip-hop activist, lecturer, and journalist Rosa Clemente spoke to students on October 13. Clemente made history in 2008 when she was selected as the Green Party’s vice presidential running mate for Congresswoman Cynthia McKinney, Democrat of Georgia, the first presidential ticket to feature two women of color. Clemente had spent the previous decade at the forefront of the social justice movements, organizing around the struggles of what has been dubbed the hip-hop generation: African Americans born between the assassination of Malcolm X, in 1965, and the emergence of hip-hop as a cultural phenomenon, in the late ’70s and early ’80s. The artists and activists at the core of this generation have targeted specific injustices infecting American society in the post-civil rights era, including minority and immigrant discrimination, inequitable education and transportation funding, police brutality, and a massive prison-industrial complex that continues to incarcerate young blacks at an increasingly high rate—the grim residue of centuries of slavery, disenfranchisement, and discrimination. With these subjects permeating her consciousness as an undergraduate in the early ’90s, Clemente began to research Puerto Rican colonization, the trans-Atlantic slave trade, and the history of race relations in America, forcing her to confront the unresolved contradictions of her own ethnic and class identity. As a result of her growing disillusionment with the self-aggrandizing narratives of American exceptionalism, Clemente began to act on her convictions. In the mid-’90s she developed Know Thy Self Productions, an independent media agency meant to give a voice to the struggles of marginalized black youths around the country. Through the medium of hip-hop, Clemente has produced major activism tours meant to generate interest and excitement in social justice, featuring figures such as M-1 of the hip-hop duo Dead Prez; comedian Dave Chappelle; and Fred Hampton Jr., who is continuing the black nationalist tradition of his father, a Black Panther leader who was assassinated in 1969 by the Chicago police and the F.B.I. That combination of anger and resistance brought Clemente to a battered New Orleans in the wake of Hurricane Katrina to report on the desperate realities of lower-class communities deluged by both natural and corporate disasters. Working as an independent investigative reporter, Clemente presented a searing indictment of deliberate governmental neglect, including a memorable account of the juxtaposition of the jam-packed New Orleans Convention Center, where “the smell of dead bodies was overwhelming,” and the “completely habitable” Marriott, Wyndham, and Holiday Inn hotels standing vacant across the street, heavily guarded by police, military contractors, and Blackwater mercenaries.